The veteran price comparison company is changing, and maybe for the better. Richard investigates one of the companies that easily met the criteria of his Fundsmith filter. I avoid Price Comparison Websites. The notion we should all be like hamsters in a wheel, swapping insurance policies and energy suppliers every year for cheaper alternatives is a bit repellent. When I try PCWs they bamboozle me with low-cost options – often from companies I have never heard of. So I let our insurance policies auto-renew for a few years and then do a comparison of my own, just two or three firms I have used before without complaint. As a citizen, I am not convinced by the money-saving, customer-churning, culture either. Energy companies, say, reduce their prices so they do well in the PCWs searches – one reason for the proliferation of tariffs. But they jack prices up when it is time to renew so they can actually make a decent profit. This sends the hamsters scurrying back to the wheel for a new deal, which is good for PCWs, they get more commission, but it breaks the link between customer and supplier, potentially degrading the quality of the service. You are probably wondering why I have chosen to investigate Moneysupermarket (the name of the group is spelt with only one capital letter, the brand, which also owns MoneySavingExpert, TravelSuperMarket and Decision Tech, has more). It is, after all, a leading member of a band of middlemen enabling a system I dislike. I could be wrong. People use these sites, and if you are one of them I apologise for the hamster metaphor. The PCWs are substantial profitable businesses. Moneysupermarket turned over £355m in 2018 and made an operating profit of £108m, GoCompare is less than half the size. Online property search company Zoopla, earned revenue of £122m in 2017 from its PCWs, uSwitch and Money. 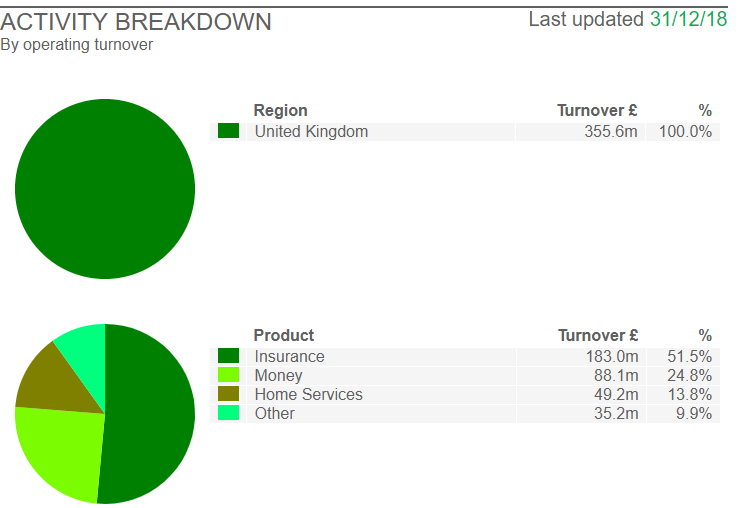 Compare the Market is privately owned and I have not got figures for it. The Fundsmith filter takes its criteria from those published by the Fundsmith Equity Fund, a popular fund that invests in high-quality companies. The statistics tell us that over the a twelve month trading period Moneysupermarket was highly profitable in accounting and cash terms, it had a very low level of financial obligations and, if it merely sustains the current level of free cash flow, the money earned by the business after the bills are paid, the company could, in theory, pay it all to shareholders and they would receive an income of 5% a year. Investors probably expect growth, which means better returns, so a baseline of 5% is, superficially, an attractive valuation. Moneysupermarket may look profitable and unencumbered by debt, but has it always been this way? 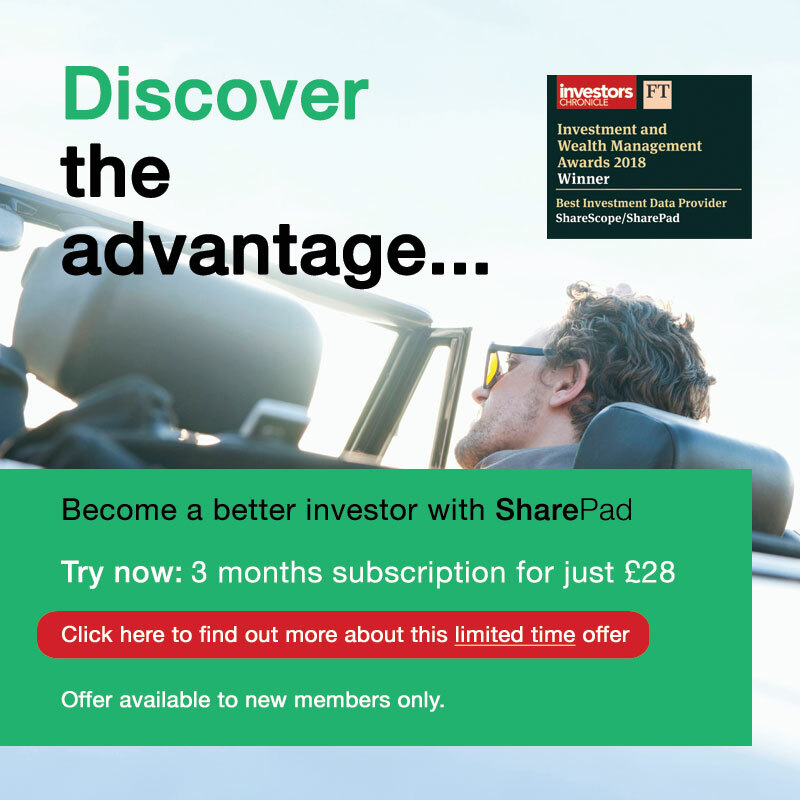 Fundsmith looks for companies that are already winners, because that is evidence they are not just flashes in the pan, so we should take a look at how Moneysupermarket’s financial performance has evolved using SharePad’s financial charting. Is growth steady or slowing? Moneysupermarket floated on the stockmarket in 2007, and as you might expect it has not always been as profitable as it is today. The financial chart that really catches the eye though, is one that shows whether growth is accelerating, steady, or slowing down. 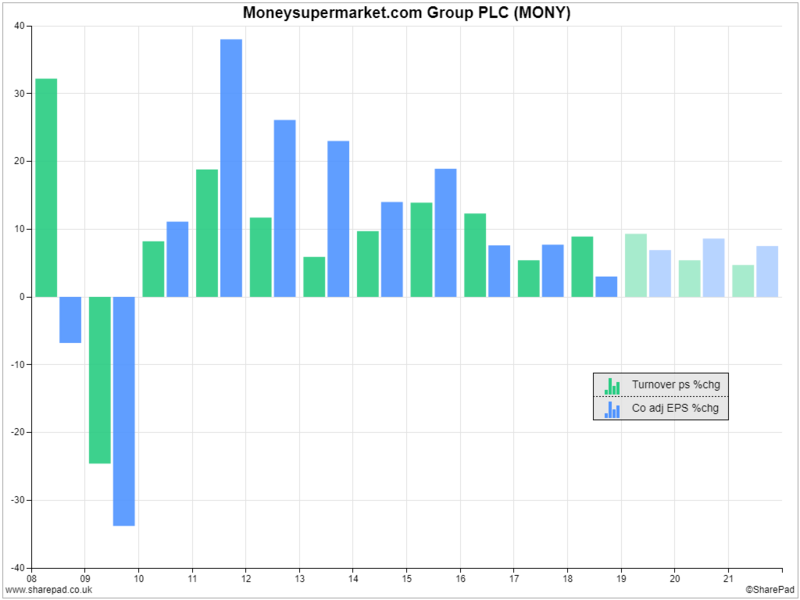 Plotting growth and contraction rather than the absolute value of turnover and profit is a good idea because financial charts in SharePad have arithmetic scales and these can give a false impression of growth (for an explanation, see Performance measurement for pros). 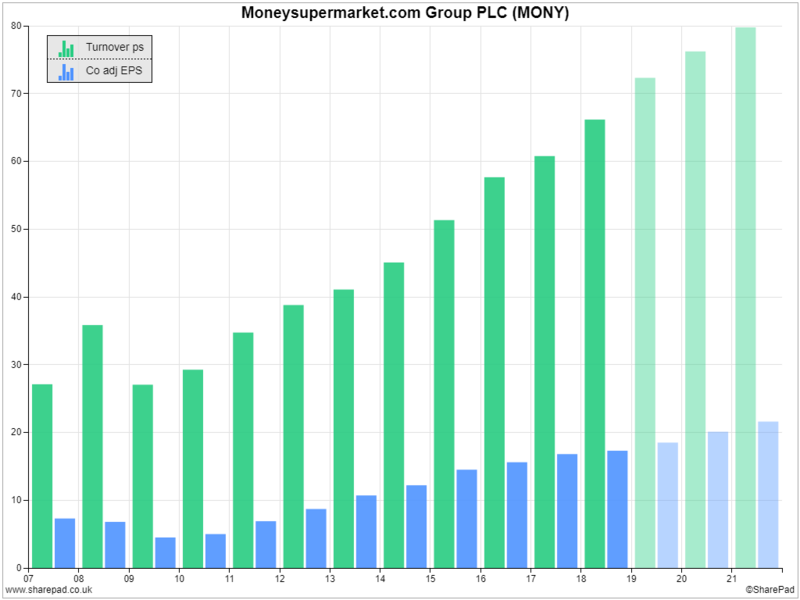 Judging by the absolute value of revenue and profit in the first chart it looks as if they are growing pretty steadily, but we can see more clearly from the second chart, growth has declined. Moneysupermarket grew strongly from the financial crisis until 2016, when annual profit growth subsided into single digits. In 2018, using company adjusted figures, profit increased by just 3%, though analysts think growth will pick up a bit (the lighter shaded bars). The reason for buying shares in high-quality companies is we expect them to grow over the long-term. If I had specified 10% annual growth in the filter, I could have excluded Moneysupermarket from consideration but I did not, because I am a heretic. Though traders frequently assume a company that has been growing strongly will continue to grow at a similar rate, studies show it is exceptionally rare for them to grow consistently. Past growth is not a reliable indicator of future growth and Moneysupermarket’s slow-down does not concern me. It is probably the reason the shares are reasonably priced. The slow-down may not persist and the share price may undervalue the growth Moneysupermarket achieves in future. Reinvention is the mother of growth. Moneysupermarket is working hard to “reaccelerate growth”. And its “Reinvent” strategy, is quite encouraging. You may already have noticed the company’s new advertising campaign. The days of pole dancing businessmen in hot pants showing how saving money on car insurance will make us feel “epic” are over. The new ads advertise MoneySuperMaaaaaaaaaahhhhhhhhhhhket, a site that “gives you clever ways to save a lot by doing very little”. It will make us feel calm. The change of emphasis is in part a recognition that the industry is maturing. Once, all a PCW had to do to get new customers was to shout about how it could save people money, preferably as loudly and often as possible. Now PCWs are having to work harder. Reportedly, Darren Bentley, MoneySuperMarket’s chief customer officer, says it feels like the industry is in a marketing arms race. The cost of advertising, particularly online, is rising and to make more money the PCWs have to convert more of the people who come to their sites into customers. It is also an acceptance of reality. Sorting out our car insurance does not make us feel epic. It is a pain in the Aaarrghhh. We’re relieved when it is over. The good news is the advertising campaign is more than just skin deep. Spending more than 10% of revenue a year on technology, the company redeveloped its systems in 2017 into an extensible cloud-based platform and optimised its sites and apps to convert more customers in 2018. Having built the infrastructure to continuously improve based on the large amount of data it collects, it is now developing new features, aka “clever ways to save”. The new mantra is personalisation and monitoring, and the first two new ways to save are “Bill Manager” a monitored energy service that offers customers better deals when it thinks they are paying too much, and “Credit Monitor”, which helps customers understand their credit rating and MoneySuperMarket offer products, credit cards say, it knows customers will qualify for. Both new ways to save are featured prominently on the MoneySuperMarket home page, which is an oasis of calm. Also in development is a new mortgage comparison tool to replace the “basic” service Moneysupermarket currently offers. It will enable customers to do the paperwork online instead of being sent to a broker. Monitoring and personalisation tie in with the next stage in the “evolution of price comparison”, which is already underway. If the customer will not come to Moneysupermarket, Moneysupermarket will “take price comparison to the user”. It may not be long before our banks are offering us better energy deals when their Moneysupermarket-powered monitoring service spots our bills are high. To help it integrate the platform with other sites, In 2018 Moneysupermarket bought Decision Tech, which already supplied price comparison services to third parties, including MoneySuperMarket and MoneySavingExpert. The strategy is coherent. The tools Moneysupermarket is developing, the advertisements it is commissioning, and the acquisitions it has made reinforce each other. Though other PCWs are thinking along similar lines, Moneysupermarket is starting from a position of strength. And as far as I can tell, it is shouting loudest about the changes it is making. I do not think the money-saving culture is an unalloyed good. I hope never to switch energy providers again now I have found one that charges loyal customers the same tariff it charges new ones. But two days in the company of Moneysupermarket’s annual reports leads me to the conclusion PCWs are growing up, and Moneysupermarket is getting better.